In the past, if you ever asked me what my favorite season was, I’d answer without hesitation. SUMMER. I love the warm weather, time at a pool/lake/ocean, cookouts, watermelon, fireflies, longer days, and all the other lovely things summertime brings. But I have a confession. The older I’ve gotten, the more I’ve come to see the “other” side of summer. The heat. The mosquitoes. (my town actually celebrates something called “Mosquitofest” because we are covered up with mosquitoes during the summer.) The snakes that lurk around my yard. In my part of the South, the heat and humidity are enough to make even the most summer-loving person think twice. As I think also about the seasons of life we go through, it occurs to me that right now I’m in a season of transition. My husband and I are getting our house ready to go on the market. We’ve been house hunting in a city about an hour from where we currently live. It means downsizing our farm and moving farther from our parents, but will put him closer to work and me closer to civilization. (The rural area I live in makes it so that I drive forty-five minutes minimum for groceries or Starbucks or restaurants…) So it’s going to be quite a change, but one that we’re excited about. I’m working now on the next book in the series, A Recipe for Romance, and I’ll admit, I’m stumped on which time of year would be the very best for the story to take place. The book releases in early January. I’m curious–as a reader, do you prefer for a book to be set during the same season it actually releases? (as in, a book coming out in December/January might have a wintery background? And a book that comes out in March might open up in the spring?) Or does it matter? 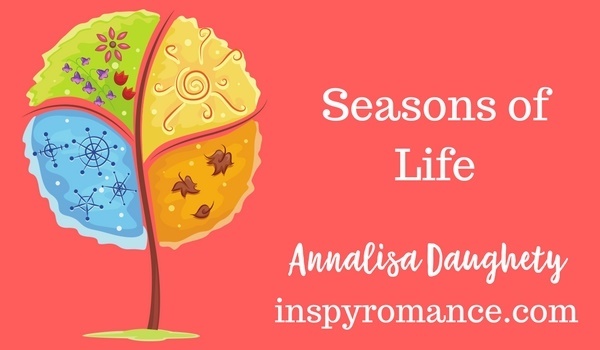 I’d love for you to chime in and let me know your thoughts on books and seasons in the comments. And if you’ve read On Board for Romance, you may want to hop over to my website! I’m doing a big giveaway of some of Riley’s favorite things–it’s some pretty fun stuff! I love all the seasons. They each have their own good points. I’m fortunate that I live in Kentucky and get to experience each season in all its glory. It doesn’t matter to me which season or seasons are represented in a book as related to its release date. Hi Annalisa! Thanks for you post. I enjoy reading your series A Homegrown Love Story in the Arcadia Romance. I am really sorry with the Amazon Publication Problem of On Board for Romance. After Amazon canceled the order, it took them over a week before Amazon sent another email stating the book had been released. As a daughter, who cared for your father for 8 years, I could relate with Riley. My father was in an assisted care facility for 6 years and enjoyed having our Sheltie visit. I wished your recipes would have been included in your book. The answer to your post question is that usually I do not mind if a book is set in in a different season than when it releases. Since each book in the Arcadia Valley series releases in a different month, I personally would like to experience Idaho at all seasons – winter, spring, summer, and fall. Also since there is some interaction with the other books – I presume October release will have a fall festival or Halloween, November – Thanksgiving, and December – Christmas or Winterfest. As I checked the weather for Idaho in January and with the swinging temperatures not sure what one can do for January. You did an excellent job with the setting in A Romance Rekindled having Kate get the farmer’s market ready for opening day (April 15). Checking the January calendar their is New Years, Epiphany (6), Human Trafficking Awareness (11), Martin Luther King (15), & Robert Burns Night (25). Plus New Year’s resolution. Our church one year did a birthday celebration for all (seated people by seasons and the cake was decorated by the season. Best wishes as you tackle your move, a new chapter in your life and a January release of Arcadia Valley Romance. Hi there and a town that is covered in mosquitos?! I would have to move! I live in a high desert and so I just deal with flies which are bad enough. Triple digit heat right now and my sheep are miserable. They, like me, love late spring and early fall for chilly nights and toasty days. I tend to “devour” books no matter what season they’re set in :-) After living in Asia for quite a few years, where there were just 2 seasons – rainy season and dry season – I thoroughly enjoy having 4 seasons again! Hello, I love spring, summer and fall. To me it does not matter when the book comes out to the season in the book. Blessings on your move and future writing!! I’ve never really considered the season in the book, except Christmas I tend to like reading those books around Christmas time, just seems to add to the feeling. My favorite season is Spring and fall, spring everything is coming back and blooming the Temps at nice it’s just that wow new beginning again. Fall I love the colors and crisp air. Here in Florida the seasons are all the same, hot and hotter. So reading a book set in the fall or winter helps, especially, in an air-conditioned house. I don’t care about the season. I read a book when I have a chance regardless of the time frame in the story. It doesn’t matter to me when a book a set, I will read it any time.